My name is Kelly Knight. I'm a librarian that loves the open road. I've worked at a library in suburban Chicago for nearly five years now as a reference librarian, but due to circumstances both personal and professional, I've decided to jump-start my career and take my career (and life) in a whole new direction. My first priority of this trip is to go from town to town and get to know the communities and the libraries in which they serve. I truly believe in the promise and necessity of public libraries and hope to highlight what makes them so important to the fabric of their respective communities. You should note, however, that I will endeavor to do open, honest reporting and will try to take the good with the bad. I am not directly affiliated with any major library association and though I'm sure our agendas will mesh more often than not, I'm sure there will be some friction with the status quo. It is my hope, however, to underscore the positive while hinting at areas of librarianship that can be improved upon. My secondary purpose of this trip is to heal my soul. The last few years of my life have been, well, they've sucked. I've have financial challenges. Personal losses. A disintegrated marriage. Deaths. I've experienced the bewilderment inherent in having a newly minted masters degree at a more advanced age than normal while competing with fresher faces in an increasingly tighter job market. Librarianship is my second career, and I always thought I wouldn't have a problem finding a steady, full-time job, especially since I had a proven track record in my prior career of professional travel service(agency). Boy, was I wrong! From time to time I will provide anecdotes and other stories regarding my recent past, but I will try to keep on the Future Path. I know there is adventure and people to meet on the open road, and I look forward to interacting with them and recording my experiences! Along the way, I'm going to have fun. 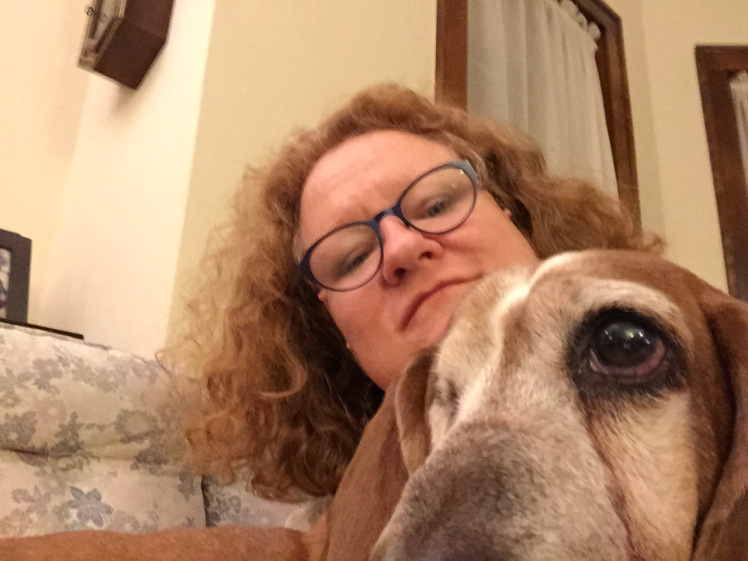 I'm bringing my nine-year-old blind, half-deaf basset hound named Mavis along for the ride. She will be reporting to you what smells have taken her fancy, what indignities she has endured, and what comforts she is missing. I'm going to take the road rarely taken, and in keeping with one of my inspirations, Blue Highways by William Least Heat Moon, I'm going to try to stay away from the Interstates and homogeneous chains of hotels and restaurants and seek out the local, the weird, and the wonderful. I'm going to stop at every historical marker I see, regardless of the obscurity, and share it with you. I'm going to reference books, movies, and other inspiration to enable you and me to understand what I'm experiencing. I'll share with you my curated road tunes via my YouTube account. I'm even going to include a page for you travel nerds out there (you know who you are) and document the minutiae of the road, i.e. my mileage count, my gas mileage, what I paid for my breakfast, how that campground site lived up to the hype, how the water pressure was at the motel, where exactly I left the LTE network on my smartphone. Yeah, you get it, there's something here for everyone. Professional library methodology observation and critiques, check. Social awareness, check. Positive experiences, check. Not-so-positive experiences, check. Travelogue, check. Travel TMI, check. Silliness with my dog, check. Come and explore with me! Hungry for more background info? See my FAQs.